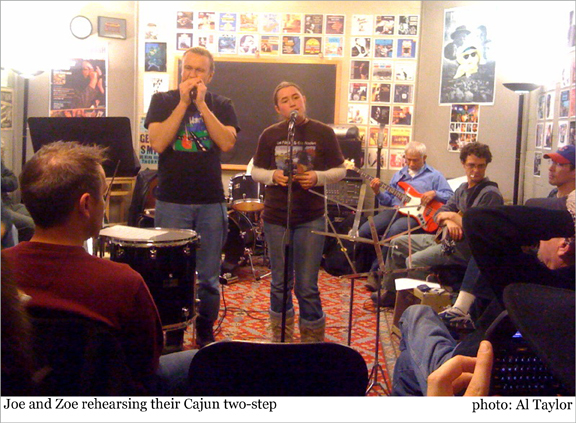 Classes this week were devoted to rehearsal for the Old Town School Blues Harmonica Recital #13 coming up this Friday, December 11, 2009 at the Harlem Avenue Lounge. We rehearsed individual songs with the band and also ran through Shoji's four-part arrangement of Silver Bells. Special thanks to Gavin Tun on bass who came out to class on his birthday last night to rehearse with us -- thanks, Gavin! The full set list for the Recital can be viewed here. "Impersonate a professional!" 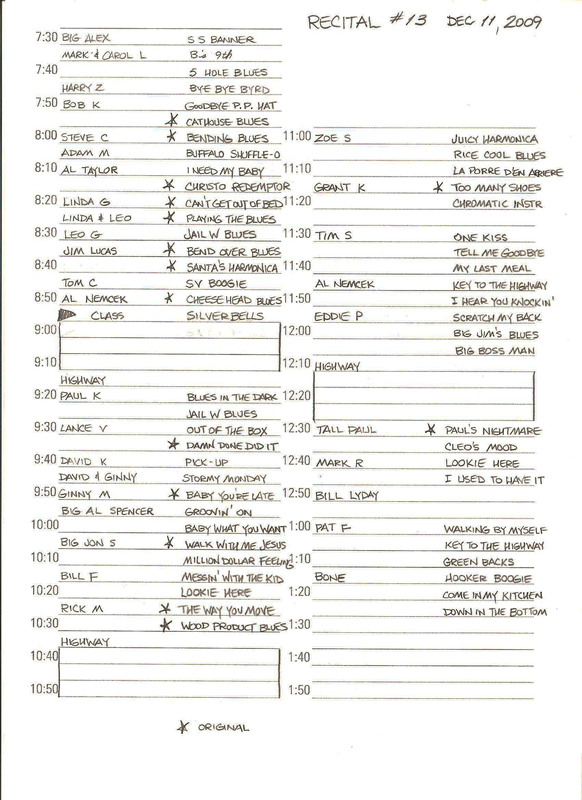 Know your time slot and remember to be 45 minutes early -- professional musicians are always early for gigs. NOTE: If you are on the recital schedule but are unable to make it at the last minute, please contact Joe or youmissedmonday. If you email info@youmissedmonday.com we will see your note even at the recital, so be sure to get in touch with us. The Silver Bells ensemble goes on at 9pm at the recital this Friday. Here's the link to Silver Bells. Also, thanks to Highway RickEy for putting together the new play-along tracks below. Choose your part from the list and you will find a play-along track that excludes your part so you can play along with the other three parts. Thanks, Highway! Grammy Nominations Include Local Harmonica Players! Chicago Blues: A Living History (Various Artists) - Larry Skoller, producer - Features harmonica players Billy Boy Arnold, Billy Branch, and Matthew Skoller; plus, Billy Flynn (guitar), Kenny "Beedy Eyes" Smith (drums), and other Chicago legends; visit www.chicagobluesalivinghistory.com. Full details at: Grammy Awards. News From The German Harmonica Museum! A season full of events and creativity is ending. Our museum published two little, but unique books (one incl. English summary and the other as full English version available), created some other new souvenirs for our shop and did a lot to preserve the very special history of the free reed instruments. Please visit us/our shop or order by e-mail! See the PDF of our new Xmas flyer! Buying books and other souvenirs is very important support for our work! Thank you very much, have a nice quiet Christmas time and a happy new year. "Hohner - The Living Legend" is a lovingly illustrated book for the 150th anniversary of the firm's founding delights the eye, shows the current product line in Trossingen, and takes you on the tracks of the harmonica in the folk music of the world. Authors: M. Haffner, H. Wenzel. Price: 48 Euros, will be sent post-free by the Museum within Europe. Order now! Get your tickets now for the next Harmonica Convergence show featuring Joe Filisko, Howard Levy, Corky Siegel and Peter Madcat Ruth at the Old Town School, March 21, 2010. The show will be a tribute to the great harmonica legend, and longtime Steve Miller Band member, Norton Buffalo. Rumor has it there may be other harp players you know in the lineup, so don't miss it! The newsletter and more is always online! Check it out for more details on newsletter items, a calendar of local gigs, jams, birthdays, archives, links, videos and special features. We welcome your input. If you're inspired to write a review of a live show, CD, DVD or book, please submit it to us for consideration.